Manhattan is a paradise of skyscrapers, which not only decorate the city’s skyline, but also provide more usable space for people living there. This design scheme starts from a most basic architectural component, an arch that undergoes transformations through the changes of light, human behavior, and other factors to form different spaces/units, which overlap one another vertically to form the final design. In both, Middle Ages cathedrals in Europe and ancient pagodas in China, we found that double-layer arches could create a mezzanine, which we cunningly combined with vertical transportation, which works exceptionally well to service spaces. This hidden space inspire us invent a new relationship between arch and transportation. Tracing back to two hundred years ago, urban growth came with the demolition of old buildings, which then were replaced with clusters of new larger and denser buildings. The original residents, in many cases, were forced to move out and were reimbursed for a monetary loss. Urbanization was based on this constant cycle. Tokyo has long been the leading city for robotics and manufacturing. The city’s fascination towards science and engineering has changed how society interact with machines. Its culture and social patterns have long revolved around its obsession with automation and its high regard for automated systems. The proliferation of vending machines in Tokyo is impossible to ignore. They are on nearly every block in Tokyo down alleyways, in front of convenience stores and almost in every neighbourhood. As a result, these machines have minimised the cost of human labour, eliminating the need for sales clerks. The Pod Vending Machine explores the possibility of converting the real estate industry into an automated vending system. Abandonment of construction projects remains a serious problem in the construction industry. It results in the wastage of materials and resources. It affects not only the immediate house buyers but also other project players and the general public. In some occasions, it also involves the use of public fund for the revival of abandoned projects. 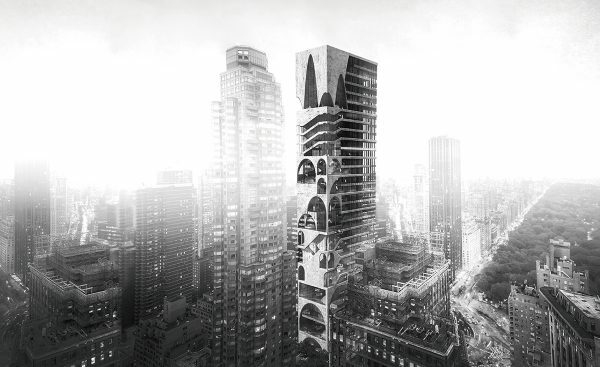 In response to the problem, the scheme proposes a building is constantly under construction: A tower that grows in parallel with the city’s housing demand. Borrowing the Japanese maxim Wabi-sabi, the building remains an ‘incomplete infrastructure’ that changes and adapts over time. A skyscraper that functions as a home dispenser. It continuously grows according to the city’s housing demand. The building production method adopts an automated system. Ready-to-use pods are manufactured, plugged onto site and can be purchased instantly. A pod printer that 3D prints modular dwellings is installed above the building. The printer will dispense pods and will grow higher as the building grows. 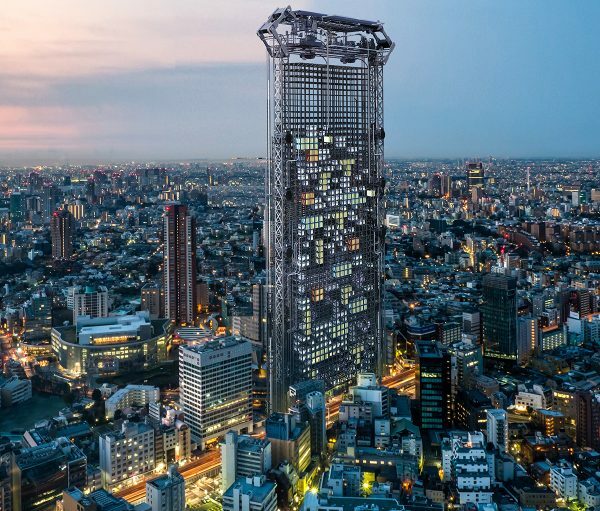 Inspired by a commonly used machine that dispenses nearly all of life’s necessities for the people of Tokyo, this vast framed structure aims to house a large number of pods equipped with basic amenities for residential and commercial use. The design of the infrastructure suggests a dynamic environment where spaces for social interaction is established in several pockets throughout the building. The spatial structure of the building is designed to be flexible and mobile. Modules within the complex can move and regroup through mobile cranes and mechanical arms. The frame structure remains a constantly growing and developing spatial complex. The series of frames and individual pods are printed by 3D printer functions as the subsequent local consolidation and change. The pods will be manufactured on-site creating an extremely efficient construction process. The pods are then transported below by cranes and plugged onto the megastructure. The positioning of the pods calculated by the building’s automated system. The 3D Printer which is constantly moving upwards receives materials that are pumped up by hydraulics on the sides of the building. Pods that are abandoned, after a certain period of time, will be dismantled and kept in storage or brought back to the printer – creating a closed loop. Dar es Salaam, Tanzania’s largest city, with a population of 4.5 million, with the city’s stable and high economic growth of 6.5% per annum over the last decade, it has become one of the fastest growing cities in the world. Due to large amounts of investments being injected into the construction, communication and mining sectors, Dar es Salaam is now prioritising infrastructural and commercial developments throughout the city. For this reason, many informal settlements are being destroyed for development, displacing hundreds and thousands of people, getting further and further away from the city’s infrastructure. Due to Dar es Salaam’s huge shift in economy, the poverty rate has declined to approximately 28%. However, one in six people still live below the national poverty line, almost unchanged due to the high population rate. While the city is growing, it is also rapidly urbanizing, but countless cannot afford to live within the city which leads to falling into informal settlements. 80% of informal settlements are overcrowded, lack clean water and adequate sanitary and are surrounded by garbage and toxic materials. With the expanding population, these problems will only escalate, putting more people’s livelihoods at risk. The proposal seeks to address these problems by adapting and reconfiguring an alternative solution for slum-dwellers, by the means of a ‘Vertical Village’. This vertical village aims to provide a higher quality of life to the inhabitants, eliminating rough and unsanitary conditions for a cleaner and safer environment. The design also recognises the key factors associates with slum communities – autonomy, flexibility and a strong sense of community. This offers dwellers the opportunity to develop in synchronisation with the rest Dar es Salaam. 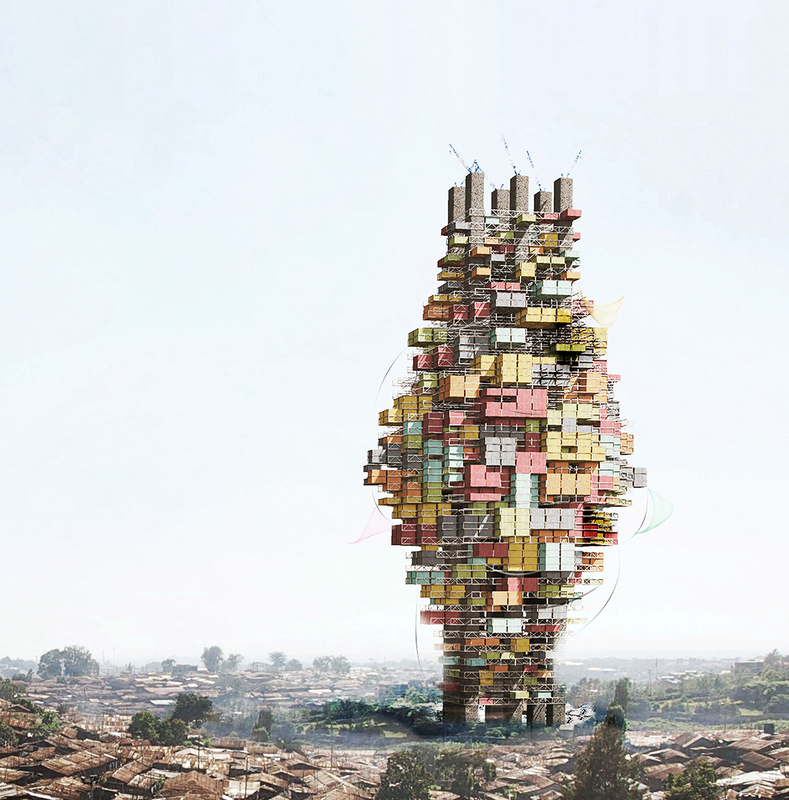 The boundaries of dwelling, work/office spaces, education and childcare, healthcare, leisure in one building have been blurred by diffusing the programmes, rather than isolating them within different sections, creates a distributed resilience, a rich and interactive environment which echoes atmospheres of slum communities. Additionally, each type of function is assigned a colour inspired by the highly saturated Tingatinga painting style, native to Dar es Salaam. A vast amount of high-rise buildings in hot climates mimic western models with sealed facades, reliant on air-conditioning and have little solar shading. This proposal intends to protect inhabitants and take advance of the weather conditions of Dar es Salaam. The building provides a naturally ventilated, perforated, indoor-outdoor and shaded model to suite the tropical climate. 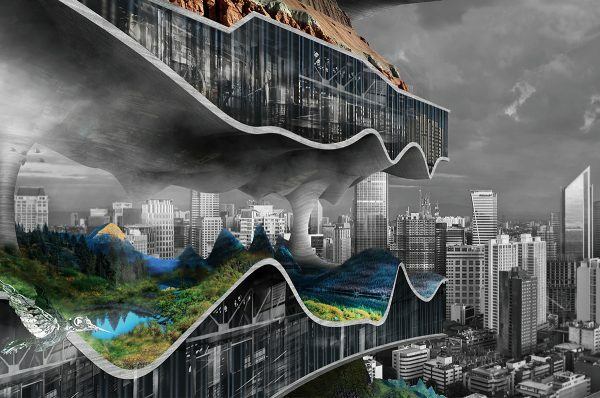 The project is modeled by slum-dwellers autonomous lives, by being self-sufficient, in mimicking nature’s closed loop system. 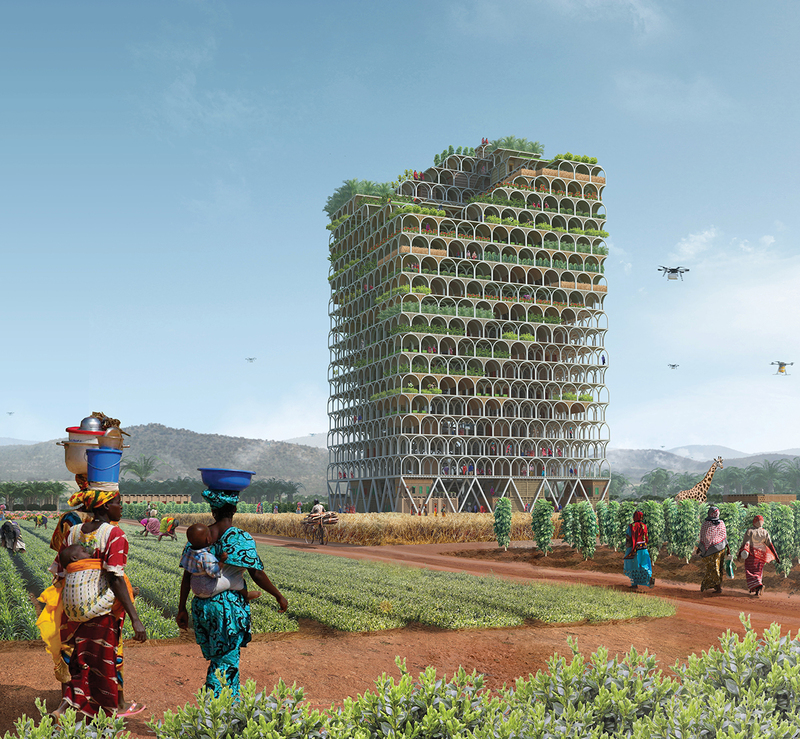 The Vertical Village is constructed above an unused swamp, which will take advantage of the water by the means of agriculture and aquaculture. Small pods are used to create nested ecologies, broadening the variety of vegetation grown in Dar es Salaam and Tanzania, offering people a more nutritious diet. The Mountain is a skyscraper located in California at Yosemite National Park. The structure reaches almost 3,000 feet in the year and is conceptualized to exist congruously with the existing environment. The illusion of separation between man and nature continues to be perpetuated in the zeitgeist of a culture where forward thinking and technological advancement come at the expense of our environment. A relationship constrictively defined as occupant (man) and habitat (nature), the general consensus is that one is recurrently intruding on the other. In the pursuit to reconcile this dichotomy, The Mountain generates a spacial and functional relationship between context and program. 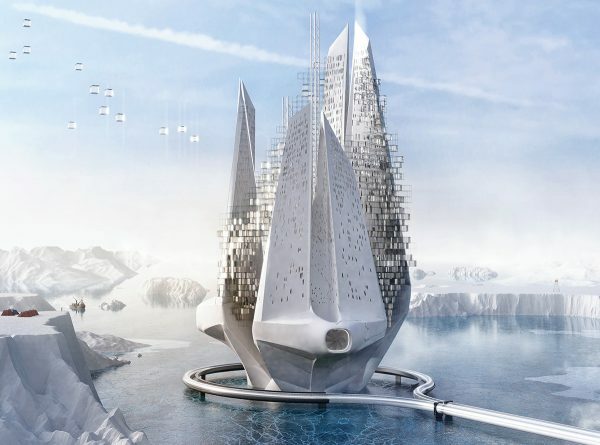 To cultivate a harmonious environment, the structure combines synthetic and natural resources that equilibrate the necessities of man and nature. 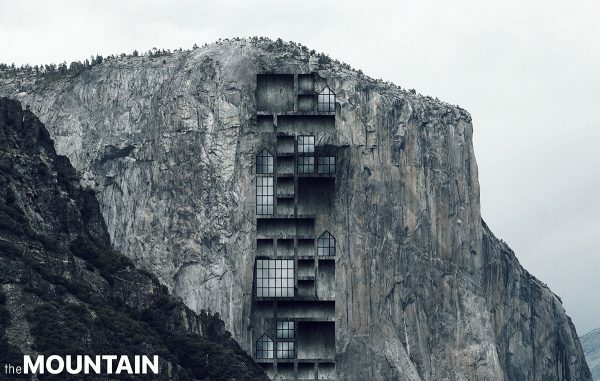 The Mountain takes the primitive idea of naturally cavernous space and combines it with the form of a modern skyscraper. Using a grid to establish a framework for the design, the mountain cliffside becomes the host for the spaces to be carved out of. These extrusions are negative spaces embedded in the towering natural structure of the earth. Individually, the habitats are able to occupy different programs varying in scale. 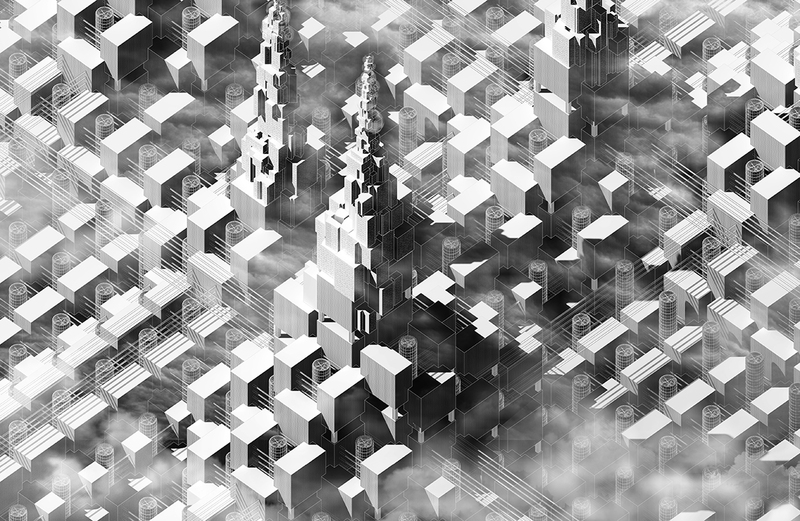 When aggregated together the volumes form a monolithic skyscraper reaching thousands of feet into the the air.